Hmm, totally missed this somehow. Well, I'm in now! Removed MetalGuy213 and Demolition - they've signed up on the USA side; removed myself too for even numbers. Sorry for the delay, Evo! We managed to miss each other on quite many occasions before we finally got this done. And respect to error for being a gentleman and giving me home server. The score would've been closer on, say, the UK server. Nevertheless, it was a well deserved win by IleKallio. Congratulations! Looking forward to future tourneys. If there is anything I can do to improve the popularity of duels again let me know! Looper, memfis: play your game, then find and play Ilekallio. We played a while ago actually but Looper is too lazy to make a post I guess. 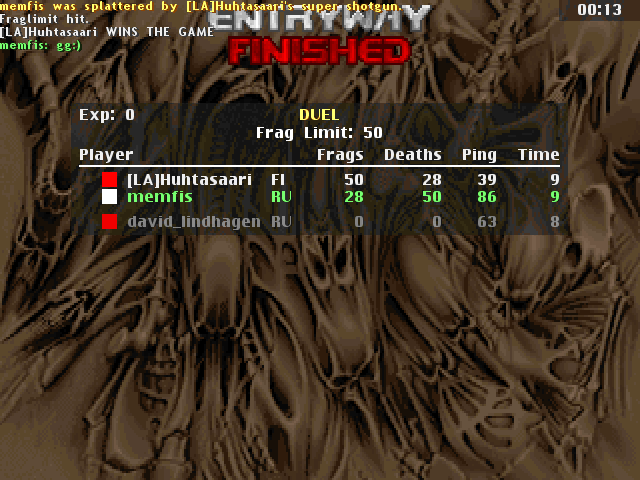 A pretty groovy match with minimal spawnrape from either side, or at least it felt like every frag was hard-fought. I was quite nervous coming into this match, because Looper has been owning me in casual games with his cg-sniping. And props to Evo for organizing this little shindig! Hopefully these tourneys will gather some more participants next time. I know I'll sign up for sure!